It's a great pleasure to be here with you today, a welcome opportunity to share some of my thoughts on developing Hong Kong's financial services and our regulatory environment. The financial services industry, contributing almost 18 per cent to our GDP, has long been the linchpin of the Hong Kong economy. And as it continues to elevate its game, getting the regulation right, and keeping it right, is no easy trick. The pitting of principles, rules and laws against the very real needs for innovation and freedom requires fine balancing and sometimes creates sparks. While we are highly committed to protecting investors and also our global reputation as an international financial centre, the last thing this Government wants to do is stifle innovation. Indeed, in order for Hong Kong to stay competitive and maintain our growth momentum, we need to be innovative as well as proactive. This is the reason why the current-term Government, which took office in July last year, is adopting a much more proactive role in driving Hong Kong's economy and enhancing our competitiveness. We will be playing the role as a facilitator and a promoter with a forward-looking and strategic perspective. We will introduce measures to support industries where we see development potential and new markets. In this regard, we have been launching new initiatives to promote the development of innovation and technology, as well as financial services. On financial services, the Government set up the Financial Leaders Forum in August last year, chaired by yours truly and comprising leaders of key stakeholders and the financial regulators. One of the key objectives of the Forum is to examine strategic and forward-looking proposals aiming to further bolster Hong Kong's financial prowess. Last September, following discussions at the Financial Leaders Forum, we announced enhancements to the Hong Kong Stock Exchange's decision-making and governance structure for listing regulation. These will enable listing policies and regulatory procedures to respond to market changes more effectively. That can only boost the competitiveness of Hong Kong's listing platform, reinforcing our status as a premier capital-formation centre. We are also preparing to roll out the expansion of Hong Kong’s listing regime to make it easier for companies from emerging and innovative sectors to list. Following discussions at the Financial Leaders Forum, the Stock Exchange will create new chapters in the Main Board Listing Rules which will permit the listing of pre-revenue biotech issuers as well as companies from emerging and innovative sectors with weighted voting right structures and will establish a new concessionary secondary listing route for Greater China and international companies that wish to secondary list in Hong Kong. In doing so, we must of course ensure a fine and proper balance between market development and investor protection. We must ensure that market quality will not be undermined as well. The Stock Exchange has proposed some safeguards, from imposing requirements for weighted voting rights' beneficiaries and limits on their powers to requiring enhanced corporate governance and disclosure. The Exchange is now consulting the market on the proposed changes, and I look forward to the implementation of the new listing regime very soon. Of course, apart from market development, it is equally important that we continue to review our regulatory mechanisms, in order to ensure the smooth and robust functioning of the financial system and markets and the overall financial stability of Hong Kong. Among other things, that means ensuring that our regulatory regimes are on par with international standards. To that end, we track developments in such multilateral institutions and forums as the G20, the Financial Stability Board and the International Organization of Securities Commissions. The Securities Commissions, as Carlson has just mentioned, is chaired by Ashley, the CEO of the SFC, our good host today. When it comes to our current regulatory environment, some context may be helpful. This year marks the 10th anniversary of the collapse of Lehman Brothers. In response to the ensuing global financial crisis, Hong Kong established a cross-sectoral resolution regime for financial institutions. It covers the banking, securities and futures and insurance sectors, giving them a set of tools designed to secure the continuity of critical financial services, while minimising risks to the public funds. This is done by imposing the cost of failure on the shareholders and creditors of the failing financial institution, which significantly mitigates the risks to the overall stability of our financial system. The resolution regime has been in place since July last year. And we will continue to ensure that it is consistent with the latest international standards. Hong Kong has also put in place a comprehensive anti-money laundering and counter-terrorist financing regime. It's built on a robust legal framework, effective law enforcement, rigorous preventive measures, capacity-building efforts and international co-operation. That said, international standards continue to evolve, which is why we have extended the current customer due diligence and record-keeping requirements to designated non-financial businesses and professions. These amendments come into operation this month. 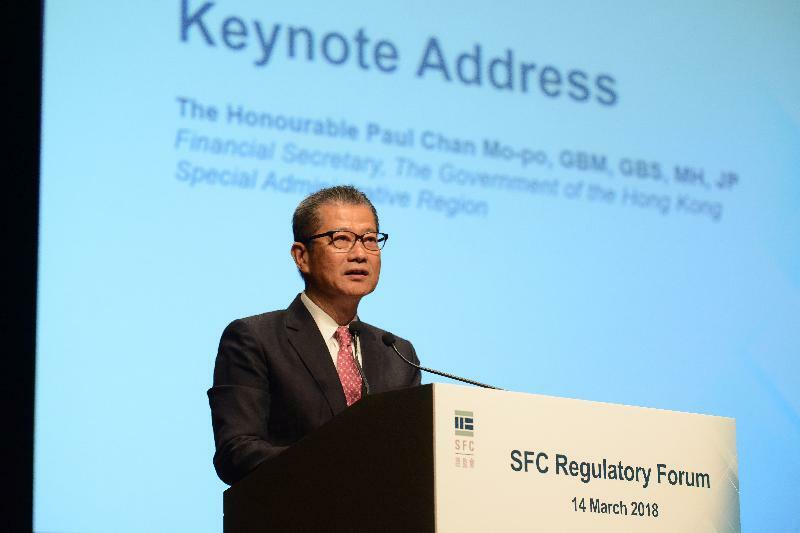 They will bring Hong Kong's regulatory regime up to date with the requirements of the Financial Action Task Force, further reducing the risk of money laundering and terrorist financing. These actions will complement the SFC's enforcement work, which includes vigorously pursuing wrongdoers, seeking remedy and deterring misconduct. Ladies and gentlemen, I would also like to take this opportunity to update you on some of our ongoing efforts on various fronts in broadening and deepening our financial markets. Strengthening our connectivity with Mainland markets is high on our agenda. The launch of our Stock Connects with Shanghai and Shenzhen and the establishment, last July, of Bond Connect are milestones in the development of capital market access between the Mainland and Hong Kong. These schemes help strengthen our securities and bond markets, while opening up the Mainland's financial markets to the rest of the world. Rest assured, we will explore a wider range of mutual-access products, including an exchange-traded fund and extending the Bond Connect to cover southbound trading. That can only create more opportunities for investors and for Hong Kong. Our city today is the world's leading offshore Renminbi business hub. We count the largest pool of Renminbi liquidity outside the Mainland. About 70 per cent of offshore Renminbi payments are handled by banks right here in Hong Kong. We value our connectivity with the international market as well. And the SFC is working to expand the distribution network for our fund industry through mutual recognition of funds (MRF) arrangements. Aside from our breakthrough arrangement with the Mainland, we have signed similar agreements with Switzerland and France. And the SFC will continue its MRF discussions with other major fund jurisdictions. Then there's Fintech. And I'm pleased to note that our banking, securities and insurance regulators have each launched a sandbox of their own. These provide a welcome and a confined regulatory environment for the testing of Fintech projects before they're rolled out to the public. Our regulators are also working together to allow the concurrent use of their sandboxes for the pilot trial of cross-sector Fintech products. Alongside Fintech, green finance is also enjoying increasing visibility. That visibility extends to the Budget that I presented two weeks ago today. In it, I announced that a green bond issuance programme will be launched, providing funding for the Government's green public works projects. The inaugural government green bond will be issued later this year. Let me add that the Hong Kong Quality Assurance Agency has launched its Green Finance Certification Scheme, offering green finance issuers third-party conformity assessments. And by introducing a Green Bond Grant Scheme, we will subsidise qualified green bond issuers who use this certification scheme. This will also encourage local, Mainland and overseas enterprises to use our capital markets in financing their green projects. And mark your calendar green for June 14. On that day, the Hong Kong Monetary Authority (HKMA) and the International Capital Markets Association will host the International Capital Markets Association Green and Social Bond Principles Annual General Meeting and Conference in Hong Kong. It will, ladies and gentlemen, be the first time this flagship international green finance event has taken place in Asia. In the Budget, I also highlighted the potential of Asia's rapidly expanding bond market, and the opportunity for us to take on a larger role. Hong Kong, of course, is already a major regional destination for bond issuance, but we can, and will, do more. First, I will expand the scope of Qualifying Debt Instruments, making bonds of any duration eligible for tax exemption in Hong Kong - provided they're registered with the Central Moneymarket Unit of the HKMA or listed on the Hong Kong Stock Exchange. Second, I will subsidise companies issuing a bond in Hong Kong for the first time, assuming up to half of the issuance cost, capped at HK$2.5 million. And they can claim that subsidy a second time within the programme's three-year pilot period. I believe these measures will boost interest and investment in our bond market. And that can only underscore the competitiveness of Hong Kong as an international financial centre. Ladies and gentlemen, I know you will enjoy today's Forum, and I wish you all the best of business in 2018.